When you are hiring a medical illustrator, you are not paying for a product, you are paying for a service. You are paying for the medical knowledge of a graphics specialist. We have literally read the medical records of and followed thousands of cases. Not only can we illustrate your clients initial traumatic injuries, treatment and surgeries, we can help you and your jury understand the future progression and future surgeries your client might require. People think their bodies are like cars. If it breaks, you take it to the shop and get it fixed, replace parts and it’s as good as new. Unfortunately, once your body is traumatically injured, be it a fracture or soft tissue injury, your body will never be the same. Your body reacts with scar tissue and overgrows bone with callus formation, thus compromising the tissue quality, reducing range of motion, reducing blood supply and altering sensation permanently and eventually producing traumatic arthritis. The doctors do not volunteer this information. They want the patient to think they can be “cured.” But if you know the right questions to ask, the doctors will admit to the progression of the injury and possibility of future surgeries and your illustrator can depict that progression for you. Joint injuries are especially prone to future complications, degeneration & surgeries. For example, take a fracture that includes a joint surface, if it is displaced, the patient might require surgery to fixate the fracture back into its proper place. Whether that fracture is completely reduced, non-displaced, requires hardware or not; the body reacts to a fracture by creating a bony callus to cement the broken piece back into place. Joints are coated with a glistening smooth layer of cartilage to function and glide smoothly. 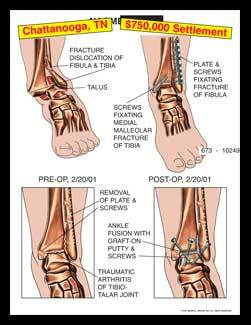 A fracture of the bone also fractures and creates cracks in the cartilage. The joint is no longer gliding smoothly and it grinds, which is painful. Eventually traumatic arthritis sets in with a very irregular joint surface which painfully grinds with every movement of that joint. This is a degenerative progressive process that just gets worse and worse, eventually rendering that joint too painful to move. With disuse, the joint eventually fuses itself or requires surgical replacement. Fusion or replacement are the only possible alternatives to a nonfunctioning painful arthritic joint. In some joints, replacement is not even an option. 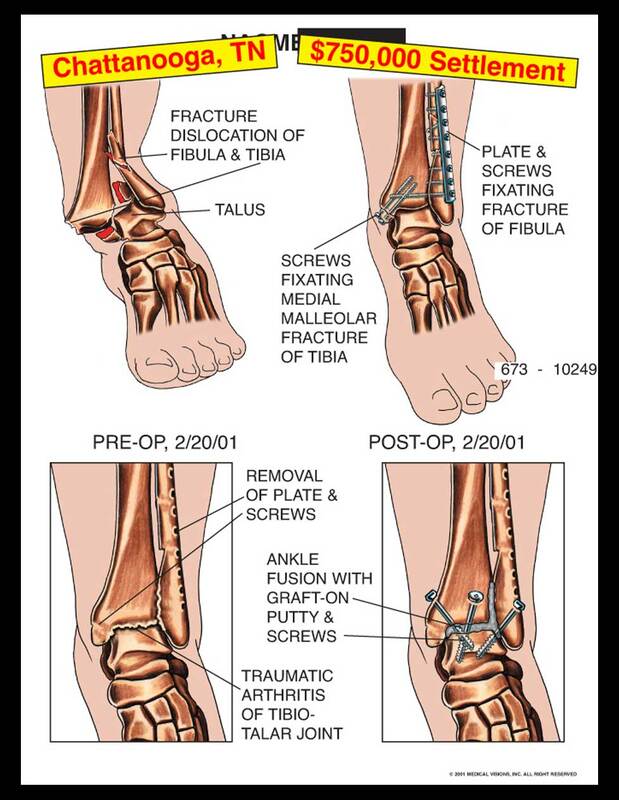 The ankle joints are so small and are required to carry so much weight compared to their size that the fusion with bone graft and screws is the only way to reduce the grinding pain of walking on an arthritic ankle joint. In the spine, the discs are a series of joints stacked on top of each other. If you have a herniation at one level, and surgically fuse it, that increases the stress on the discs above and below that fusion. Those discs were probably also injured during the initial trauma and will eventually degenerate and herniate, and also require another fusion either above or below the first fusion. This requires gong back in, removing the first plate and screws and putting in a longer plate and screws to span both discectomies. The only way to prevent recurrent disc herniations is to completely excise the disc and fuse it. These days, the doctors are fusing both the disc space and the facet joints on the back of the spine with bone graft and hardware. They are trying “disc replacement” surgery but I personally do not see much hope for this because it allows motion. Usually the facet joints on the back of the spine are also traumatically arthritic so any continued motion at that level will continue to be a source of pain. Any trauma to a joint, be it a fracture or just a severe sprain is gong to eventually lead to traumatic arthritis and a lot of pain. Your doctor knows this but will not necessary admit to it unless asked point blank about whether your client will develop traumatic arthritis and what type of pain, treatment, injections, arthroscopy, replacement or fusion will be required to reduce the pain. Our goal at Medical Visions, Inc. is to make your job, your medical expert’s job and the jury’s experience a positive and stress free event. Our case specific exhibits are designed for non-medical jurors to quickly grasp get straight to the point without confusing or distracting clutter. Elizabeth’s education and extensive experience can ensure that your medical expert’s exhibits are an asset to your case. Despite any treatment or surgery, your client’s body will never function the same or be pain free again and you can depict the future conditions and surgeries with medical illustrations.